Upon arrival at the FMUL, the secondary school students were warmly greeted by the organising team who were committed to making this an unforgettable day. 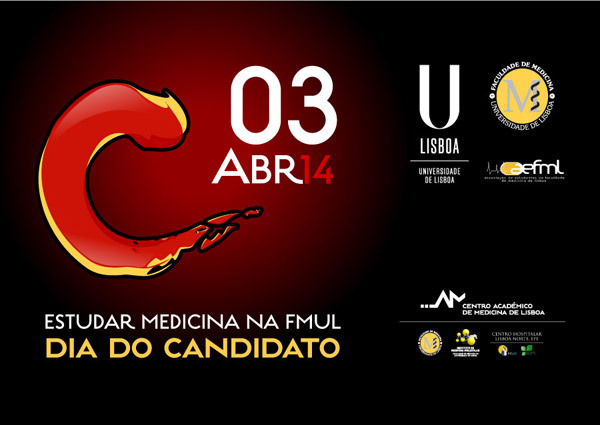 Both Professor Miguel Castanho, FMUL Vice Dean, and Professor António Vaz Carneiro, head of the Advanced Training Institute welcomed the prospective students, introduced them to the FMUL, presented the Integrated Master’s Degree in Medicine (CMIM), and ensured students were left with no doubts. Special emphasis was placed on the sixth-year clinical traineeship given its specificity and importance within the CMIM-FMUL. The Undergraduate Open Day provides secondary school students with an opportunity to get a feel for what it means to be a FMUL medical student, enabling them to come and spend a full day at our School. I was asked to speak about the sixth-year clinical traineeship programme under the topic “Experiencing the Realities of Clinical Practice, Teaching and Research”. In my presentation I tried to show that the sixth year is very different from the other years of the Integrated Master’s Degree in Medicine in terms of structure and organisation and that even though it seems to be looming in the distant future for prospective undergraduate students, it has particular features which I would like to have known about before entering this School; and that is precisely why I decided to mention them. ince the Open Day activities were geared towards young people wanting to enter Medical School, it made perfect sense for current FMUL students to also actively participate in these activities, since they too had once been in exactly the same position and had seen their wish come true by entering the FMUL. It is during periods of hardship that discontent should push bold, creative spirits forward to embrace new challenges and bravely face the unknown. 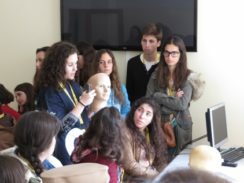 And that was exactly what happened on April 3, 2014, when secondary school students from all over Portugal visited the Faculty of Medicine, University of Lisbon (FMUL). 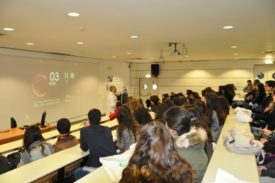 As shown by the various lectures given on Open Day, the FMUL excels in the quality of its teaching standards and innovative curriculum organisation. Additionally, it is unique in that it grants undergraduates both the privilege and the opportunity to put theory into practice by allowing each and every student to contribute to innovation in medicine. 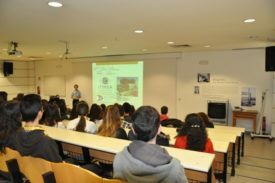 My task on Open Day was to speak about the indissociable relationship between research and the Integrated Master’s Degree in Medicine. I talked about my research at the Institute of Molecular Medicine and about how that experience has made me a better student today and will hopefully shape the kind of doctor I would like to become. I was prompted to do research out of a sense of “mere” curiosity with regard to the unknown, the constant challenge to my imagination and knowledge, but what makes me want to carry on doing it is a novel way of thinking and interpreting… Research has taught me to think objectively, critically and constructively. It has taught me to pick out the tree amidst the forest and to understand how it contributes to (dis)harmony. To my mind, this is one of the most important reasons why our School stands out amongst all the others: the FMUL does not merely produce “medical technicians” with the ability to follow protocols, but rather it creates critically-minded physicians who contribute to the development of worldwide medicine and who do not give in to conformism; on the contrary they expect to find answers to questions never asked before. This is precisely the kind of enterprising spirit that sets the very good physician apart from the brilliant physician-researcher (Presentation). Another FMUL undergraduate, Fillipo Bongiovanni, spoke about his experience as an ERASMUS student. Both Carolina Dinis Godinho Geadas and Pedro Miguel dos Anjos Rocha Alves, who took part in the Clinical Traineeship Programme in Africa, spoke enthusiastically about their clinical traineeship in Mozambique and Cape Verde and aroused great interest from the audience. 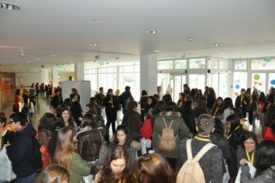 The FMUL Students Union could not have been unrepresented in the Open Day and its members spoke enthusiastically about the activities carried out by this centenary union. 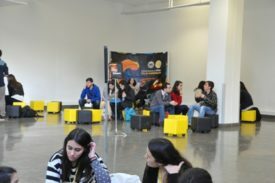 One of the highlights of the day was the lunch break as it enabled the secondary school students to enjoy a well-earned rest and provided them with the opportunity to socialise amongst themselves and with the FMUL students. At the end of the day, feedback indicated that the secondary school students were very happy with the Open Day and that it had matched their expectations. To read more about students’ feedback click here.